Gold futures retreated for a sixth straight session on Thursday, pressured by news that U.S. inflation declined for a second consecutive month and as outflows in gold ETFs continue. Gold for June delivery lost $9.30, or 0.7%, to settle at $1,386.90 an ounce on the Comex in New York. Prices traded from an intraday low of $1,368.00 to a high of $1,397.00. "There has been heavy fund selling in the past few days, and we continue to see this rotation out of precious metals," Frank McGhee, the head dealer at Integrated Brokerage Services LLC in Chicago, said in a telephone interview according to Bloomberg. "We’re not seeing a runaway recovery, but we’re getting growth and little inflation, so the reasons for the original run-up in gold are fading away." Inflation in the U.S. over the past 12 months eased from an increase of 1.5% to 1.1% as consumer prices fell 0.4% in April — a second straight monthly decline, the Labor Department reported Thursday. "Nary a whiff of inflation is diminishing the appeal of gold as a hedge against price risks, while continued gains in equities are weighing on the yellow metal’s more general safe-haven appeal," MarketWatch quoted Peter Grant, chief market analyst at USAGold. Declines in consumer prices were led by gas with prices at the pump tumbling 8.1% in April. They had surged 9.1% as recently as February. While gold has behaved in a less than traditional manner in recent years, it has consistently been purchased as a hedge against inflation. The latest U.S. government CPI data elicited more talk about deflation than the potential for rising inflation. "There is presently a low-inflation environment in the major world economies, with even some talk of deflationary price pressures building," Jim Wyckoff, a senior analyst at Kitco Inc., said in the daily PM Kitco Metals Roundup. 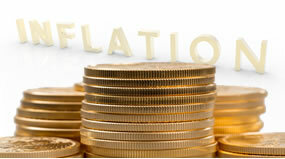 "Deflation is the archenemy of all raw commodity markets, including the precious metals." In other precious metals, silver was about flat. Though for the records, it snapped a two-session losing streak by inching up one-tenth of a cent. Silver for July delivery settled at $22.658 an ounce, ranging from $22.06 to $22.77. July platinum shed $5.10, or 0.3%, to close at $1,485.60 an ounce, marking a second day of losses. The precious metal traded between $1,470.00 and $1,492.90. Gaining for the sixth time in seven sessions, palladium for June delivery advanced $11.70, or 1.6%, to $740.75 an ounce. Prices traded between $716.00 and $743.00. Sales of U.S. Mint bullion gold coins notched solid daily gains. American Gold Eagles added 11,000 ounces with three different sizes rising. Sales for the Gold Eagles will end this week at least five times higher than last week. American Gold Buffalo coins also rose by 1,500 ounces on Thursday. The following are daily, May and year-to-date bullion coin totals as published by the United States Mint. *The U.S. Mint has temporarily suspended sales of its smallest American Gold Eagle until inventories are replenished. The Mint ran out of them on April 22. I am happy that there is no inflation and that prices for medical care, food, fuel, insuance, utility bills, and so forth are all going to be dropping so substantially. The underlying basis of the economy is so sound I cannot hardly disguise my joy!